It was no laughing matter when a rabbi, a priest, a minister and a pastor went down with the ship in World War II. 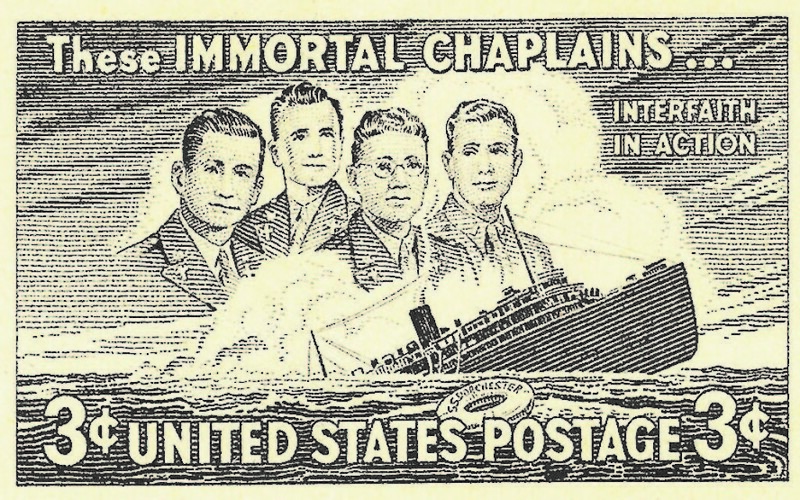 A U.S. stamp commemorates the Four Chaplains. An important 75th anniversary in American Jewish history is approaching. In the early years of the Second World War, an Army transport ship left America for Europe with 900 soldiers on board. These troops were accompanied on this long journey by four military clergy: John Washington, a Catholic priest; George Fox, a Methodist minister; Clark Poling, a pastor of the Dutch Reformed Church; and Rabbi Alexander Goode. In the early morning hours of Feb. 3, 1943, the ship entered an area of the northern Atlantic where German submarines had been sinking ships at a rapid pace. The men were ordered to sleep with their uniforms on, including their boots, gloves and life jackets. Their berthing areas were in the lower decks of the ship. Unfortunately, at 1 a.m. the ship was torpedoed and began to sink. The order to abandon ship was quickly given. The men who had been asleep realized they had mere moments to make it to the top deck of the listing ship and into the few lifeboats available. In their panic, the men, struggling to make their way to safety, came to the lifeboats without much of their personal equipment. Over the course of the night, that had discarded their boots, gloves and life vests for comfort. Without these items, they would not survive in the frigid waters of the ocean. Into this maelstrom, which occurred within moments, walked the four chaplains, who had been sleeping closer to the top deck. Their official task was to help the men into the lifeboats and accompany them as they rowed away. They did much more than that. As the desperate men came on deck without various items, the chaplains gave their jackets, boots and life vests to whoever needed them, ensuring that the soldiers had a better chance of survival and rescue. In doing so, they sealed their own fate. One of the lasting memories of the survivors was the chaplains gathering together, offering final prayers and holding on to one another as the ship sank beneath the frigid, unforgiving waves. This event, in which only 200 of the 900 soldiers survived, became known as the story of the Four Chaplains. It gave the country an enormous morale boost during the early years of the war. We were fighting enemies who envisioned a world based on prejudice, hatred and evil. This story reflected another type of vision: a country based on mutual respect and dignity for all and an amazing nation devoted to its notions of freedom and liberty. 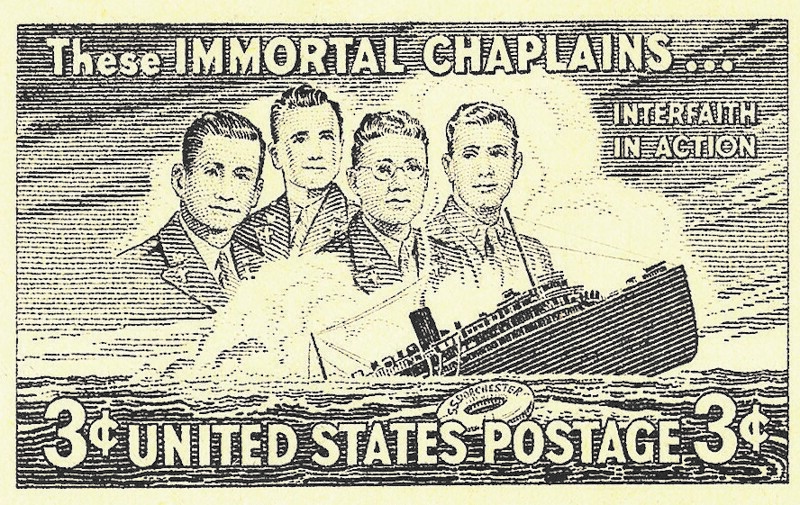 A special postage stamp was made in memory of the Four Chaplains, and places of worship were dedicated to them. Each of the chaplains had special qualities. George Fox, a Methodist, had served in World War I as a medic and been wounded. When his son enlisted in the Marines in World War II, he signed on with the Army as a chaplain. Clark Poling came from a prominent religious family. His church told him that his primary responsibility was to family and church. Nonetheless, he volunteered for service. He told the congregation that he felt a religious duty to serve as a military cleric. John Washington’s lifelong dream had been to become a priest. During the war, he had two brothers who joined the armed forces in defense of America. During his last visit home, he asked everyone to say prayers for him. He sensed that he was going into a new, dangerous reality. He left behind a wife and young daughter. As we note this event, we humbly recognize the bravery of men and women who have served and those who still do in the armed forces, police and fire departments, and other first-responder services. They daily put their lives at risk for our freedom. This story reminds us of the value of selflessness that these people of G-d exhibited. In a moment of supreme personal sacrifice and dedication, they placed the lives of others over their own. This was America at her best.